Mai senza smalto! : Non fatelo a casa vostra! - Don't do this at home! Non fatelo a casa vostra! - Don't do this at home! 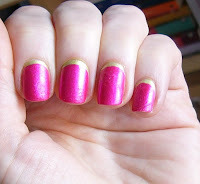 Small post on a recently mess I did: to cover green polish I tried a similar-ruffian with a Sephora fuchsia (very nice, will do a mani with it and post soon); as I wasn't satisfied I decided not to put Seche and after a while I went to bed. The morning after: real disaster, I did not "stamp" my nails with sheets since ???. I didn't remember that "before" dry fast top coat era it took so much to polish to dry. La mattina dopo disastro supremo! Erano anni che non mi stampavo le lenzuola sulle unghie; non mi ricordavo che "prima" dei fast dry top coat bisognasse aspettare tanto! !